With five years of research and development undertaken, Tyre Stewardship Australia is now turning its focus to the latest iteration of its market development fund – demonstration and infrastructure. In one of his former roles at Sustainability Victoria, environmental planning expert Liam O’Keefe recalls a workshop five years ago. The workshop was held with the Australian Asphalt Pavement Association (AAPA), the Australian Road Research Board (ARRB), Department of Environment & Heritage Protection (EHP) and Transport and Main Roads (TMR) Queensland, VicRoads and other related authorities. Although it was early days for tyre-derived product commercialisation, Liam says it was one of the preliminary conversations for what came to be the National Market Development Strategy for Used Tyres. “We did some research with Transport and Main Roads, EHP, ARRB, AAPA and Sustainability Victoria in the original collaborative works and we asked ourselves: what do we need to do to make this work?” Liam says. He says a leading member of that project stated that a key factor for driving positive change in the roads sector was creating the political will to do so. Over time, this created a shared awareness of the issues and a mutual understanding of the positive role each stakeholder group could play in providing positive outcomes for the resource recovery and road construction industries. He says the hard work of agencies like AAPA, VicRoads, Sustainability Victoria, EHP, TMR and the tyre industry-backed Tyre Stewardship Australia (TSA) has seen the landscape change dramatically since then. Since commencing its market development fund in late 2015, TSA has committed to funding more than $3 million in research and development across civil engineering, road and rail construction and thermal applications. Additionally, stakeholders such as AAPA, TMR, ARRB and VicRoads have facilitated the trials of the various rubber binder types within the respective sectors. TSA is able to support such initiatives through the Tyre Stewardship Fund, the market development tool of the Tyre Stewardship Scheme – authorised by the Australian Competition and Consumer Commission (ACCC). TSA’s National Market Development Strategy for Used Tyres, which received approval by Australia’s state and territory environment ministers, also gave it a clear framework to support end markets for tyre-derived products (TDP) into the future. Now as TSA’s Market Development Manager, Liam says he has capitalised on the hard work of stakeholders and is now ready to help take the fund to the next level. “A lot of foundation work has gone into creating the conditions we have now,” Liam says. According to the strategy, in 2009-10 about 66 per cent of end-of-life tyres went to landfill or an unknown fate. By 2015-16, the figure had reduced to 63 per cent. The efforts of government agencies have helped mitigate our ongoing tyre challenge, particularly when you consider end-of-life tyre generation increased by 16 per cent to 56.3 million equivalent passenger units over the same period. In May this year, the ACCC announced it would grant the Tyre Stewardship Scheme a new authorisation for a further six years. The Tyre Stewardship Scheme’s reauthorisation comes with increased flexibility to its fund structure, allowing it to move beyond R&D with the release of its new Demonstration and Infrastructure fund portfolio. “The initial fund was fairly narrow as there was a reluctance to negatively disrupt existing businesses within the sector. The R&D framework was then developed as a way of initiating new and emerging markets and potentially expanding on existing ones to support such players,” Liam explains. He says demonstration and infrastructure will drive a harder and more immediate anticipated consumption of TDP. “We want to support infrastructure that exists for a period of time and demonstrates capacity in the market to consume TDP on an ongoing basis,” Liam says. He says a good example of demonstration and infrastructure was a University of Melbourne trial with Merlin Site Services to develop an optimum blend of permeable paving from used tyres on campus. 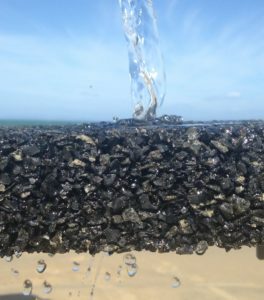 The trial found a way to incorporate recycled tyres and use them to create urban paving that can provide water to nearby trees. A 2018 trial of the system involved four different pavement mixes for different uses, including footpaths, bike paths, car parks and low-volume traffic roads. Liam says that numerous councils, in addition to a large urban infrastructure company, have already expressed interest in pursuing the paving option – which would be used in local government bike tracks and car parks very soon. He says the next stage for the fund is to support end use consumption of more TDP to create further demand for recycled tyre product that TSA recyclers’ produce. For example, Liam says Victoria uses about 800,000 equivalent passenger units in its spray seals annually – a practice that TSA hopes to replicate in other states across Australia. Demand for TDP has been increasing. “The next step is servicing the market so that they can consume TDP on an ongoing basis and the simplest example is looking at rubberised roads as we know there is demand,” Liam says. One example of the collaborative effort of roads and government agencies is the development of new national specifications for crumb rubber modified asphalt by AAPA, TSA, TMR, Main Roads WA, Sustainability Victoria and the ARRB. The specifications would see increased use of domestic crumb rubber modified open graded and gap graded asphalt. 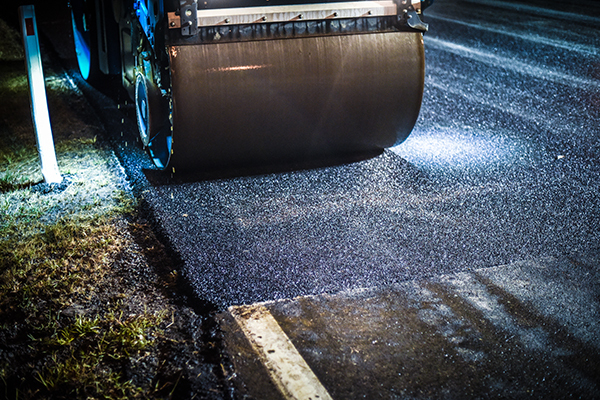 Crumb rubber modified binder has not been widely deployed in asphalt applications in Australia, rather historically it has primarily been used for spray sealing roads. “There might be some companies which produce binders, but they have conventional set-ups and they might need to augment their manufacturing or production processes to be able to handle the rubberised content to ensure they don’t undermine the existing product use,” Liam says. Liam adds that it’s also about minimising the risk for producers. He says he has had consistent feedback from recyclers who have indicated to him that demand for TDP, in particular crumb for roads, is rising exponentially. He adds that as TSA focuses on greater outcomes in infrastructure, it will also address other elements that are required to support a strong market development program and market. And although TSA is evolving, Liam says that at the core, its role will stay the same. “Although it sounds like a shift, it really doesn’t change the fundamentals of the process of the fund in terms of accepting applications, processing them and supporting different projects,” he says. This article was published in the October issue of Waste Management Review.